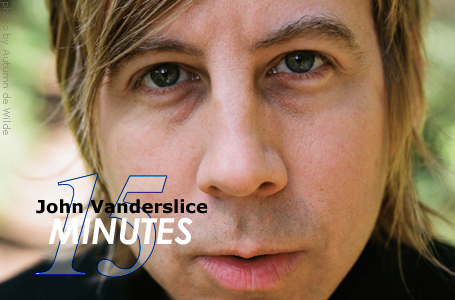 From the early days of MK Ultra to his present solo career, John Vanderslice has been one of my favorite innovators of music, and a Ladewig-curated mixtape would be incomplete without a song from his library. Vanderslice operates a studio (Tiny Telephone) in San Francisco and is surrounded by a tight-knit group of friends who help him capture the creative sounds he desires, both in the studio and in his live show. One of the most genuine people I've ever had the opportunity to interview, JV doesn't have a big head, just a big sense of humor and a plethora of creativity. With a genius eye (and ear) for the beautiful and creative, I am constantly surprised by the lack of media attention he garners. Recently, Mr. Vanderslice was kind enough to give me some of his time to play catch up. LAS: What is the first song you learned to play? John Vanderslice: "Eight Line Poem," from Hunky Dory, by David Bowie. I was in 7th grade. I know you're a fan of good cinema, can you tell me which movie (or movies) have influenced you the most? How much time do you get to spend with those you love? Probably more than most people, because my schedule is more flexible. Touring is very social and you make two or three stops in dozens of towns a year. Sometimes it's absolutely strange to me you can have a friend in Vienna or St Augustine or Norman that you see often. If you could write an album with any rap star, which would you want to write it with and why? Eminem. He's an incredibly good writer and hasn't tapped into everything he could do. The coast of Northern California. The road to Hana in Maui. Thailand. Tokyo. Wyoming. A lot of the US is incredible. Who is winning the 'I have a better studio' contest between you and Jim Eno right now? Oh, Eno won a long time ago. He's got more income, guile and motivation. I would love to make a record there. But Tiny Telephone has a lot of things Jim doesn't have: a grand piano, a Hammond B3 and tons of keyboards. What is the worst album in your home library? Well, that's a tough one as records change as the context of listening to them changes. A prefab sprout record alone is not the same record when played at a party. There are records that are ruined because of a bad recording or mastering job, those are the ones that make me crazy. In my opinion, your albums keep getting more amazing with each one you release, but you started your solo career with an A-caliber record; why is it you haven't gotten the recognition and notification you deserve? Well, those are nice words! I don't take anything for granted so I'm a little shocked at how many records I sell and how many people come to shows. I am very aware of how many excellent records come out EVERY WEEK. It is hard to have any kind of career, and that's a good thing, we live in a very competitive and musically overabundant culture, which is a good thing� So maybe I look at these things differently? What is a personal superstition of yours? I am wracked with anxiety while flying. I was in a 747 that dropped a few hundred feet over the middle of the Pacific and I haven't recovered. If you bought a new puppy today, what would you name it? Nowadays, a lot of independent artists are selling their songs to TV shows and advertisers in hopes to get more exposure. In what medium, or for which product would you consider selling one of your songs? Hilton or Marriott hotels, Apple, Josephson Microphones� I'm sure you see where I'm going with this! What's the worst way your name has been spelled? Vanderslic - So close, yet so far! Exactly where I am now, but with more gold bullion.